i'm new to the forum and new to BPs. I am planning on getting my first BP (maybe 2!) at the upcoming Tinley Park show. I just ordered the T8 as well, and I am glad I read the above post , because I will have to call them myself today to make sure that center channel is cut. This post was a great guide. I set mine up very similar to Serpent Merchant but with RHPs instead of Flexwatt. i read somewhere that flexwatt needs a gap for air flow between cages when stacking or it could be hazardous? so i was wondering if anyone does anything extra when stacking AP cages or others to prevent this? any response will help thanks guys! When regulated with a thermostat (which flexwatt must be) There is no need for an air gap as the thermostat will prevent any heat build up from occurring. New here...I have a BP who is out growing the ten gallon aquarium I currently have him in and was looking at one of these pvc cages to house him in. I have a few questions though. First would a animal plastics T-1 or T-3 be big enough for a full grown male? (He isn't full grown yet but I don't want to have to make another purchase. and I know the T8 is cheaper but I don't want something that big, unless I have too.) Also the room I keep him in generally stays around 68- 70 in the winter so I am guessing that I will need a RHP. How exactly does that work...will it just sit ontop of the cage or do special holes have to be cut or something? Also How exactly do keep a hot spot with that without the ambient temps being too high? I am guessing I will need a flex watt as well? Will that work with an in. of cypress mulch substrate? Also a question not related to pvc specifically but what size repti basics hide would work for a 300g BP but allow room for not replacing it for a while. I would certainly go with the T-8 with the pop-in/pop-out divider. You can divide the enclosure 50/50, 70/30, 80/20 and so on until they're full grown. Call Animal Plastics about RHPs or shoot them an email. They can tell you which ones they prefer and once ordered, they can be directly shipped to Animal Plastics and they will get them tapped for you. Just my own suggestion. Last edited by Willie76; 03-13-2013 at 05:36 PM. You will just use screws to mount the RHP to the roof, inside the enclosure. Here is a pic of my RHP's mounted in my T8. Cages are setup with lights and RHP's from Pro-Products, using Cypress Mulch for Bedding (roughly 2") deep. Using Herpstat 2 and digital Hygrometer/Therm combo from Xikar. I have the probes from the Herpstat on the opposite end of the RHP, right above the bedding, mounted on the back wall. I also have the Hygrom mounted on the back wall on the cool end as well. 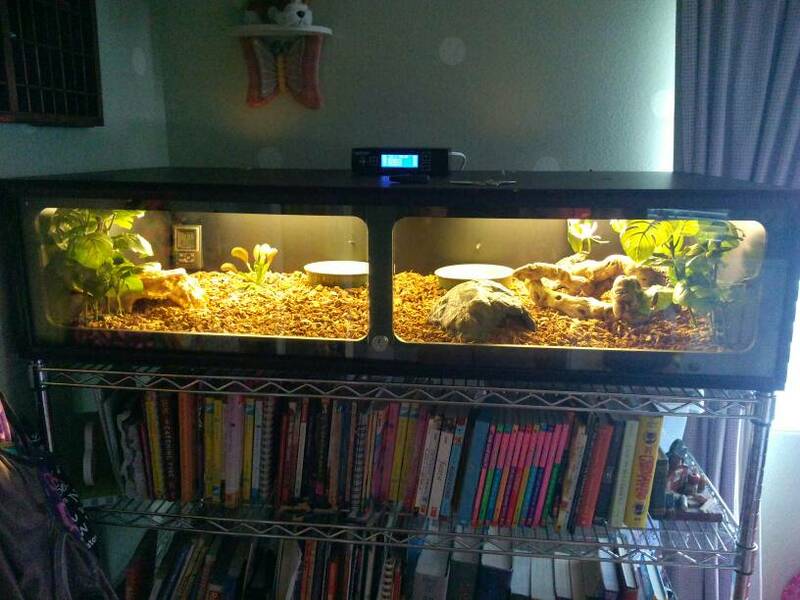 I put the cypress mulch in and installed the glass doors, turned on the lights, set the Herpstat 2 for 90. The probes are reading 79 - 81 on the cool end, but the humidity is reading 90% on my Xikar with an ambient of 90 also. I don't have my Bp's in the cages yet, but am concerned about controlling the humidity. I'm not sure if I should reduce the Herpstat Temp Settings a little lower or remove some of the bedding? I don't even have water in the water dishes yet. thoughts or suggestions would be greatly appreciated.